In this section, you'll allow users to reset their passwords through Azure Active Directory (Azure AD), which is then replicated to your local Active Directory Domain Services (AD DS). This process is known as password writeback. With password writeback, users don’t need to update their passwords through the on-premises Active Directory Domain Services (AD DS) where user accounts and their attributes are stored. This is valuable to roaming or remote users who do not have a remote access connection to the on-premises network. Password writeback is required to fully utilize Identity Protection feature capabilities, such as requiring users to change their on-premises passwords when there has been a high risk of account compromise detected. For additional information and configuration instructions, see Azure AD SSPR with password writeback. Upgrade to the latest version of Azure AD Connect to ensure the best possible experience and new features as they are released. For more information, see Custom installation of Azure AD Connect. In this section, you'll enable self-service password reset (SSPR) to allow users to reset or unlock their passwords or accounts. To alert you to misuse or abuse, you can use the detailed reporting that tracks when users access the system, along with notifications. You must enable password writeback before you can deploy password resets. See the instructions to roll out password reset. In this section, you'll set up Azure Active Directory Seamless Single Sign-On (Azure AD Seamless SSO) to allow your users to sign in to services that use Azure AD user accounts without having to type in their passwords, and in many cases, their usernames. This gives your users easier access to cloud-based applications, such as Office 365, without needing any additional on-premises components such as identity federation servers. You'll configure Azure AD Seamless SSO with the Azure AD Connect tool. See the instructions to configure Azure AD Seamless SSO. In this section, you'll help users recognize your organization’s sign-in page by adding your company name, logo, and other recognizable elements. 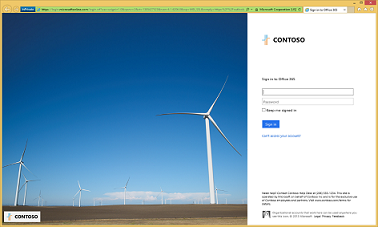 With Microsoft 365 Enterprise, you can customize the appearance of the sign-in and Access Panel pages so they include your company logo, color schemes, and custom user information. 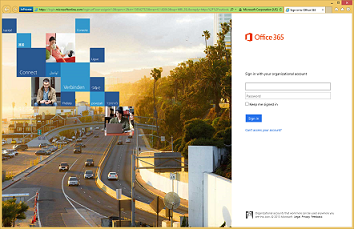 When a user attempts to sign in from a device, they see something like the following example on the Office 365 sign-in page before customization. And here is what the same user of the Contoso Corporation would see after customization. For more information, see Add your company branding to Office 365 Sign In page. For configuration instructions, see Add company branding to your sign-in and Access Panel pages.